I made some feminine cards with that same OSW recipe I used the other day when I made the masculine birthday cards. I made this card especially for my husband's cousin - we love her bunches!! She has a birthday today and we wanted to let her know we were thinking about her more than just posting a happy birthday message on her FaceBook page. 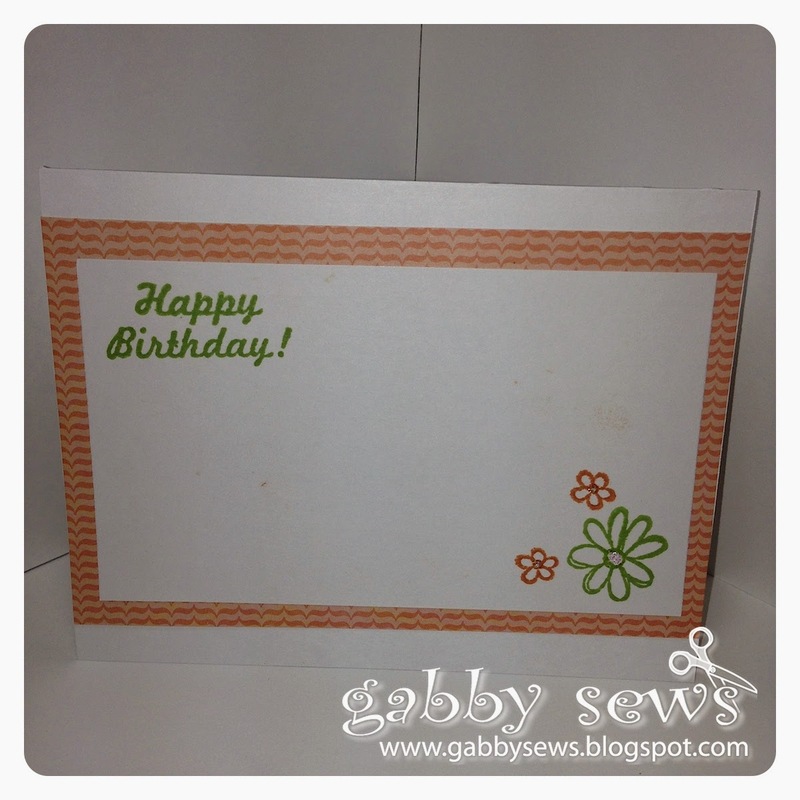 The sentiments are from the Fiskars Happy Birthday set. The flowers and the tag border came from the Fiskars Terrific Tags set. I used Momento Dew Drop inks in Tangelo and Bamboo Leaves for the stamping and some Diamond Stickles in the centers of the flowers to give them some sparkle. The paper is from the We R Memory Keepers Simply Spring 6 x 6 pad. I love this pad and wish I would have bought all they had when I found them at Tuesday Morning. I also got the larger 12 X 12 boxed set that I plan to use soon on a mini album. If you see either of these sets at your Tuesday Morning I highly recommend them. The paper is really high quality and coordinates well. The background paper is some solid card stock from Core'dinations that I embossed with a Darice Large Petal embossing folder. I used some American Crafts twine on the tag that I cut out with my Cricut using the Tags, Bags, Boxes and More cartridge. I also used the rest of the OSW cuts to make some additional Hello cards for OWH. I cut the sentiment paper at 1.5" x 2" and then rounded two corners on the one design and all four corners on the other design. I used Momento Dew Drop Ink in Tangelo to ink the edges. I ended up being able to make seven Hello cards and the one birthday card for our special cousin out of just two sheets of patterned 6 X 6 paper!! These OSW layouts are the best! !